This article refers to the Israeli administrative division. For the biblical regions of Judea and Samaria, see Judea and Samaria. For the biblical kingdoms see Kingdom of Judea and Kingdom of Israel (Samaria). Judea and Samaria Area (Hebrew: אֵזוֹר יְהוּדָה וְשׁוֹמְרוֹן, Ezor Yehuda VeShomron, also an acronym יו"ש Yosh or ש"י Shai; Arabic: يهودا والسامرة‎, Yahuda was-Sāmerah) is the Israeli government term for the administrative division encompassing Israeli-occupied West Bank excluding East Jerusalem. It is for some purposes regarded by Israeli authorities as one of its administrative regions, although the international community considers the West Bank to be a territory held by Israel under military occupation. The Judea and Samaria Area covers a portion of the territory designated by the ancient names Judea and Samaria. Samaria corresponds to part of the ancient Kingdom of Israel, also known as the Northern Kingdom. Judea corresponds to part of the ancient Kingdom of Judah, also known as the Southern Kingdom. Following the occupation of the West Bank, which was then ruled by Jordan, by Israel in 1967, the Israeli right began to refer to the territories by their Hebrew names and argued for their integration into Israel on historical, religious, nationalist and security grounds. In December 1967, the Israeli military government issued an order that stated: "the term 'Judea and Samaria region' shall be identical in meaning for all purposes to the term 'the West Bank Region'" and had in early 1968 been officially adopted. However, the phrase was rarely used until 1977 when Menachem Begin, a proponent of extending Israel's sovereignty to the region, became prime minister. The phrase is still used today by various figures who support Israeli annexation of the area. The name Judea, when used in Judea and Samaria, refers to all of the region south of Jerusalem, including Gush Etzion and Har Hebron. The region of Samaria, on the other hand, refers to the area north of Jerusalem. East Jerusalem has been incorporated into the Jerusalem District and is under Israeli civilian rule, and is thus excluded from the administrative structure of the Judea and Samaria Area. The terms "West Bank" (HaGada HaMa'aravit: הגדה המערבית), or, alternatively, "the Territories" (HaShtahim: השטחים), are also current in Israeli usage. The Judea and Samaria Area is administered by the Israel Defense Forces Central Command, and military law is applied. Administrative decisions are subject to the Command's chief. The incumbent chief of Central Command is Aluf Nitzan Alon. The future status of the region is a key factor in the ongoing Israeli–Palestinian conflict. The West Bank (including East Jerusalem) and Gaza Strip are considered occupied Palestinian territories by the United Nations, the United States, the International Court of Justice, the European Union, and by non-governmental organizations such as Amnesty International, Human Rights Watch, and B'Tselem. The Supreme Court of Israel has considered the section of the West Bank which excludes East Jerusalem to be Israeli-occupied territories. On 13 May 2012, a bill to extend Israeli law to the Israeli settlements in the Judea and Samaria Area initiated by Knesset member Miri Regev (Likud) first approved by the majority of the Ministerial Committee for Legislation was rejected in a second round of votes after prime minister Benjamin Netanyahu had instructed his ministers to vote against the bill. Extending Israeli law to the settlements would mean a de facto annexation of the settlements to Israel. In July 2012, a government-commissioned report from a three-member committee, called Levy Report, asserted, based on a number of reasons, that there is no legal basis under international law to refer to Judea and Samaria as "occupied territory". Article 43 of the Fourth Hague Convention of 1907 is the basis of the Levy committee's opinion. The area is further divided into 8 military administrative regions: Menashe (Jenin area), HaBik'a (Jordan Valley), Shomron (Shechem area, known in Arabic as Nablus), Efrayim (Tulkarm area), Binyamin (Ramallah/al-Bireh area), Maccabim (Maccabim area), Etzion (Bethlehem area) and Yehuda (Hebron area). ^ "Settlement population growth slows for 10th straight year". Israel Hayom. Retrieved 9 January 2019. ^ a b "Statistical Abstract of Israel 2012" (PDF). Archived from the original (PDF) on 15 December 2013. Retrieved 15 January 2013. 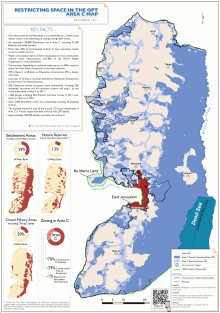 ^ STUDY ON THE GEOGRAPHIC COVERAGE OF ISRAELI DATA "All references in the Statistical Abstract refer to “6 districts”, which thus excludes the Israeli settlements in the West Bank as a District. In the Key to Codes for Maps, though, “Judea and Samaria” (West Bank) is listed under the heading “District”, though the maps themselves do not delineate or list Judea and Samaria (West Bank) as a district. Nevertheless, while the place of the Israeli settlements in the West Bank in the geographic hierarchy is unclear, statistics provided at the District level are normally available for the “Israeli settlements in Judea and Samaria” as well." ^ Roland Otto (1 December 2011). Targeted Killings and International Law: With Special Regard to Human Rights and International Humanitarian Law. Springer Science & Business Media. p. 38. ISBN 978-3-642-24858-0. ^ Neil Caplan (19 September 2011). The Israel-Palestine Conflict: Contested Histories. John Wiley & Sons. pp. 18–. ISBN 978-1-4443-5786-8. ^ Alan Dowty (11 June 2012). Israel / Palestine. Polity. pp. 130–131. ISBN 978-0-7456-5612-0. ^ Emma Playfair (1992). International Law and the Administration of Occupied Territories: Two Decades of Israeli Occupation of the West Bank and Gaza Strip. Oxford University Press. p. 41. On 17 December 1967, the Israeli military government issued an order stating that "the term 'Judea and Samaria region' shall be identical in meaning for all purposes . .to the term 'the West Bank Region'". This change in terminology, which has been followed in Israeli official statements since that time, reflected a historic attachment to these areas and rejection of a name that was seen as implying Jordanian sovereignty over them. ^ a b Shlomo Gazit (2003). Trapped Fools: Thirty Years of Israeli Policy in the Territories. Routledge. p. 162. [...] the Likud Government was not satisfied with the name 'Administered Territories'. Even though the name 'Judea and Samaria' had been officially adopted as early as the beginning of 1968 instead of the 'West Bank', it has hardly been used until 1977. ^ Ian Lustick (2002). The Riddle of Nationalism: The Dialectic of Religion and Nationalism in the Middle East. Logos, vol. 1, no 3. pp. 18–44. The terms "occupied territory" or "West Bank" were forbidden in news reports. Television and radio journalists were banned from initiating interviews with Arabs who recognized the PLO as their representative. ^ Myron J. Aronoff (1991). Israeli Visions and Divisions: Cultural Change and Political Conflict. Transaction Publishers. p. 10. [...] "Judea and Samaria", the biblical terms that the Likud government succeeded in substituting for what had previously been called by many the West Bank, the occupied territories, or simply the territories. The successful gaining of the popular acceptance of these terms was a prelude to gaining popular acceptance of the government's settlement policies. ^ Ran HaCohen (1992). Influence of the Middle East Peace Process on the Hebrew Language. Undoing and Redoing Corpus Planning, Michael G. Clyne (ed.). pp. 385–414, 397. During a short period immediately after the 1967 war, the official term employed was 'the Occupied Territories' (ha-shetahim ha-kevushim). It was soon replaced by 'the Administered Territories' (ha-shetahim ha-muhzakim) and then by the (Biblical) Hebrew geographical terms "Judea and Samaria". The latter were officially adopted and successfully promoted by the governments (since 1977) and are still the official terms in use. ^ "Judea and Samaria Are Israel". 9 February 2014. ^ Fendel, Hillel. "Conference Urges Israeli Sovereignty Over Judea And Samaria". ^ "Resolution 242 of 22 November 1967" (PDF). UN. Archived from the original (PDF) on 23 May 2012. Retrieved 31 May 2012. ^ "West Bank". The World Factbook. CIA, USA. Retrieved 17 October 2011. ^ "Disputes - International: Gaza Strip". The World Factbook. CIA, USA. Retrieved 17 October 2011. ^ "Middle East Peace process". EEAS (European External Action Service). Retrieved 30 November 2016. ^ "Annual Report 2011". Amnesty International. Archived from the original on 23 March 2010. Retrieved 17 October 2011. ^ "Israel and the Occupied Territories". Human Rights Watch. Retrieved 17 October 2011. ^ "Land Expropriation and Settlements in the International Law". B'Tselem. Retrieved 17 October 2011. ^ "Legal Consequences of the Construction of a Wall in the Occupied Palestinian Territory (Request for advisory opinion) - Summary of the Advisory Opinion of 9 July 2004" (PDF). International Court of Justice. 9 July 2004. Archived from the original (PDF) on 25 August 2014. ^ "The High Court of Justice HCJ 7957/04 ruling on the fence surrounding Alfei Menashe". Haaretz. 15 September 2005. ^ Jonathan Lis (13 May 2012). "In about-face, Israeli ministers block bill to annex West Bank settlements". Haaretz. Retrieved 31 May 2012. ^ Isabel Kershner (9 July 2012). "Validate Settlements, Israeli Panel Suggests". The New York Times. Wikimedia Commons has media related to Judea and Samaria District.